Using stocks and stock options to develop a low-risk, wealth-building strategy for retail investors. Selling puts is a strategy similar to, but not precisely the same as, covered call writing. Mastering either strategy is a huge opportunity for retail investors to secure our financial futures. Mastering both will allow us focus in on the best investment choices depending on market conditions and personal risk tolerance. 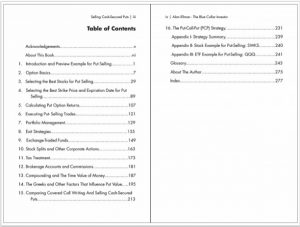 The purpose of this book is to give the reader the tools to master a conservative stock and option strategy with the goals of generating monthly cash flow and focusing in on capital preservation. Selling cash-secured puts is a low-risk strategy that leverages high-quality stocks and exchange-traded funds to accomplish these objectives. This book will present basic option principles that apply to this system and will walk you through the process of stock and option selection. Additionally, calculating profits and position management will also be critical topics addressed. In other words, every aspect of this strategy will be discussed including the necessary steps to take before, during and after a trade is executed. Examples of real-life trade executions will be shown in conjunction with illustrative charts and graphs, and the rationale for each step behind the trade will be explained using easy-to-understand terminology. 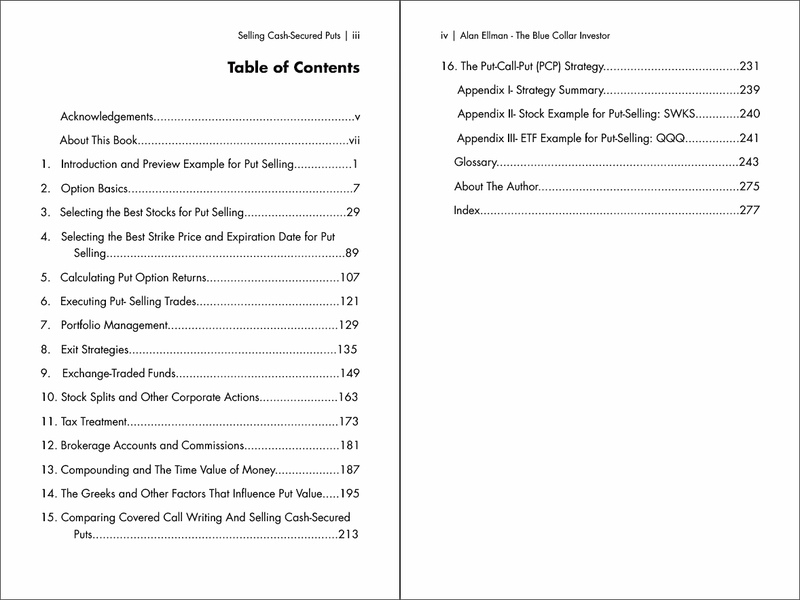 I will also allude to another similar strategy, covered call writing, the topic of my first three books. The risk-reward profile of the two strategies are similar but certain nuances make them different and I feel it is important to discuss those distinctions as I present the material needed to master this great strategy of selling cash-secured puts. 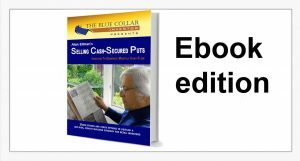 The goal of this book is to give you the education to apply basic investment principles in all situations. Your financial decisions will become non-emotional and based on sound fundamental, technical and common sense principles. I will not tell you what to do but rather how to do it and why. I want you to benefit from all the mistakes. I suffered through and then corrected as I taught myself these two outstanding strategies. I have been very fortunate in my investment and financial past and at this point want to share the knowledge that I have accumulated with as many average retail investors as possible. That is my goal, my mission for this book. After reading and re-reading this book I hope you feel that I achieved this goal. +Easy to understand option strategy. +For conservative investors with low risk tolerance. +Generate monthly cash flow while capital preservation remain a priority. +Use with covered call writing to create a multi-tiered cash-generating strategy.